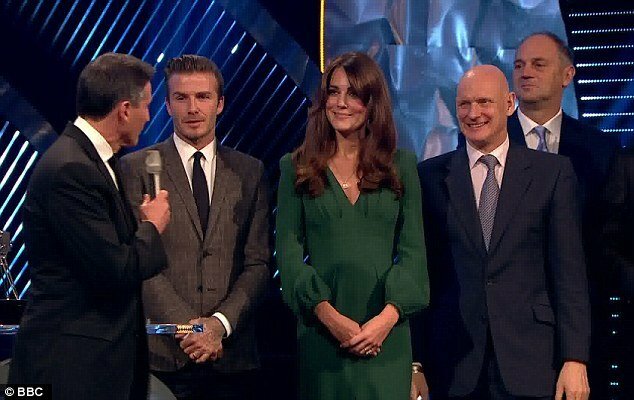 Kate Middleton made her first formal public appearance since her pregnancy was announced at the BBC Sports Personality of the Year ceremony in London, where she presented two awards. The Duchess of Cambridge walked out in an Alexander McQueen green dress matched with a striking smile as she presented chairman of the London Organizing Committee for the Olympic Games Sebastian Coe with the Lifetime Achievement award. She stayed on the stage throughout Sebastian Coe’s speech and was then on hand to present the Sports Personality of the Year award on to Bradley Wiggins. Runner-up was Team GB heptathlete Jessica Ennis, who won gold in the 2012 Games, and in third place was tennis star Andy Murray, who also won gold at the London Olympics. Kate Middleton’s decision to honor the engagement after being forced to cancel her last four public appearances is a sign that the 30-year-old is slowly recovering after spending several days in hospital with hyperemesis gravidarum earlier this month. Aides said the duchess, a Team GB Ambassador, was keen to attend to pay tribute to the achievements of British sportsmen and women in a remarkable year for British sport. A fortnight after she fell ill with a crippling form of morning sickness, the Duchess finally made her first formal public appearance. But sources close to Kate Middleton, less than 12 weeks pregnant, stressed that she would only attend the evening-long event at London’s ExCel for around 45 minutes before returning home to Kensington Palace, where she continues to recuperate. Doctors have warned her that the condition can recur at any time in the first few months of pregnancy – and sometimes even beyond. “While the Duchess does not feel ready to attend a four-hour engagement, she is keen to show her support to the UK’s sportsmen and women at this prestigious event which caps a momentous year for British sport,” said a senior royal source. Kate Middleton attended the event alone as her husband, Prince William, has been forced to return to their rented farmhouse in Anglesey, North Wales, as he is due on duty as an RAF Search and Rescue pilot. But the fact that the prince felt confident enough to leave her suggests that he, too, is encouraged by her recovery. Prince William will return to London in time for Christmas but aides have yet to announce whether they plan to join the Royal Family at Sandringham, in line with tradition. While it would be extremely unusual for the future king and his wife to miss the annual celebrations on the Queen’s Norfolk estate – including the traditional visit to church on Christmas morning – sources have indicated that Kate Middleton is “seriously” considering remaining in Berkshire with her family so she can recover in peace and be closer to hospital if she takes a turn for the worse. Her decision will be announced in the next day or so.